Cheese Grits Soufflé ready for presentation. For a soufflé this height, I filled the dish to about one-and-a-half inches below the rim. You can also tie parchment paper around the outside of your dish if you want to make a taller one, then remove the paper before serving. Cheese Grits Soufflé. I guess it really is true that you can take the man out of ‘Bama but you can’t take ‘Bama out of the man. When you cook a big dinner for 10 hungry beachcombers every weekend, some of whom frequent your table every other week and almost all of them at least once a month, coming up with a different starch every week can be a challenge. Potatoes can be mashed, roasted with rosemary, baked au gratin or made into a salad on barbecue days – and rice has all sorts of variations – but after about the fourth or fifth week, the rice/potato/rice monotony begins to get old, and you start looking for something else; maybe even something unexpected. 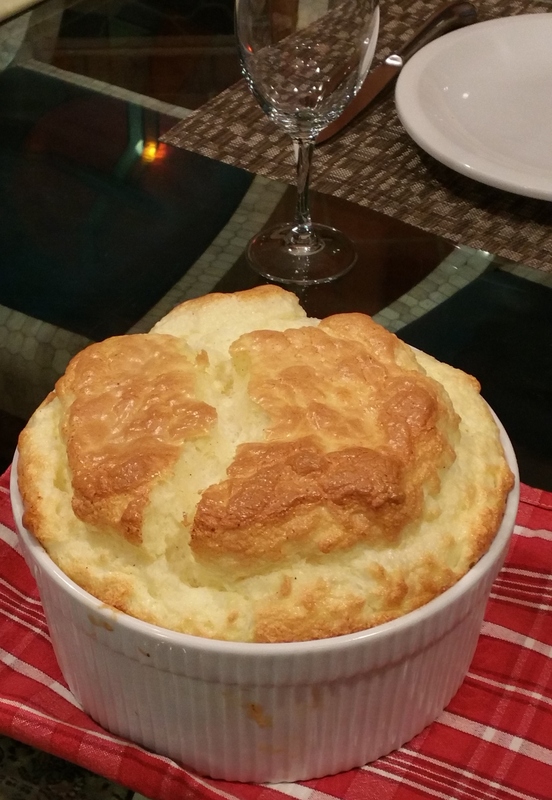 This idea was somewhat successful, but I was not entirely pleased since, made in the usual way, the grits were just a little too heavy for a mid-summer meal, so the next time I considered the cheese-grits option, I thought: why not whip up lots of egg whites and turn it into a soufflé? Now that, I thought, would check all the boxes: a truly creative way to serve carbs that was not only delicious and satisfying, but also light and airy enough to serve on a hot, muggy night. Now, three points: ALL SOUFFLÉS FALL. Which means that the success or failure of your presentation is very much a function of timing. Be sure your diners are already sitting at the table when you present your soufflé. It deserves an entrance. Secondly, use the stalest eggs you have. Older eggs hold their shape better than fresher ones. Have all ingredients at room temperature. Set up electric mixer to whip egg whites when the time comes. Prepare ingredients all ahead of time since you will want to assemble the soufflé quickly once you get started (and remember, don’t even start the assembly until an hour before you intend to present to your seated guests). 1) Grate the cheese, place in a large mixing bowl (I use stainless) and set aside, 2) separate the eggs and place whites in bowl of mixer and yolks in separate small mixing bowl and set aside, 3) cut butter pieces and set aside, 4) place cold grits and water in quart-sized Pyrex measuring cup and stir, 5) measure out half-and-half and have it and the salt and pepper at the ready. Now, place grits mixture in microwave and cook for one minute, then stir, cook for another two minutes until done (total of three minutes, in my microwave, fully cooks the grits. Adjust for your own appliance if needed). While grits are cooking, whip egg yolks vigorously with wire whisk for a full minute, then add the half-and-half to them, stir and set aside. Once grits are done, take immediately from the microwave while very hot and add to the cheese in the mixing bowl. Add butter pats to this mixture and stir until the cheese and butter are melted and well combined with the grits. Let rest while you beat the egg whites. Begin beating the egg whites and once they begin to froth, add the acid (either cream of tartar or lemon juice) to help the eggs hold together. Beat until stiff peaks form (at just the point where the shiny egg whites begin to go matte). By now, the hot grit mixture is cool enough to add the egg yolks mixture, so stir in and mix well. Add salt and pepper until it is just a tad too salty and the pepper is easily tasted (once diluted by the egg whites, this over-spicing will disappear). Pour mixture into your prepared soufflé dish. Jiggle just a tiny bit to level the top and place in the oven. DO NOT OPEN OVEN as it cooks and try to keep noise and disturbances in the vicinity of the oven to a minimum. After 35 minutes, you can sneak a quick peak to check on doneness, but do so very, very gently. Cook for 40 to 45 minutes or until the top looks golden brown (like the photo). Remove and serve instantly. You won’t believe how good it is. As always, sending this recipe with love! This entry was posted in Angels, belief, cooking, God the Father, Love, recipes and tagged carbs, Cheese, cheese grits, cheese grits souffle, delicious, egg dishes, Grits, grits dishes, savory, souffle, souffles, starch. Bookmark the permalink. Thank you for sharing this excellent tutorial! See It. Know It. Do It.